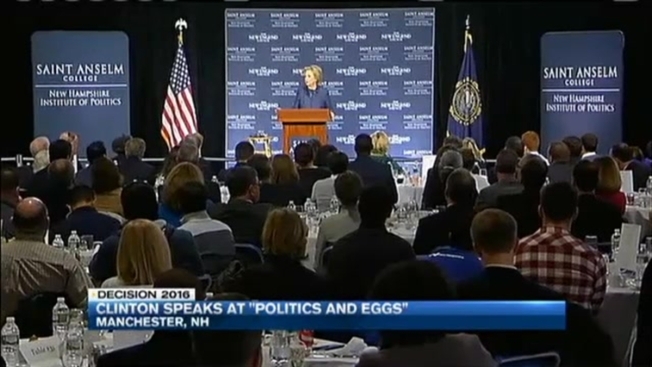 Clinton at 'Politics & Eggs' Event in N.H.
Hillary Clinton spoke at a "Politics & Eggs" event in New Hampshire on Wednesday. She's addressed an audience at 12:30 p.m. at Saint Anselm College in Manchester. It's one of four scheduled stops in the state this week. The series is a joint initiative of The New England Council and The New Hampshire Institute of Politics & Political Library at Saint Anselm College. In recent months, "Politics & Eggs" has hosted Republican U.S. Sens. Ted Cruz and Marco Rubio; Republican Govs. Chris Christie, Bobby Jindal and John Kasich; and former Republican Gov. Jeb Bush and Democratic Gov. Martin O'Malley.